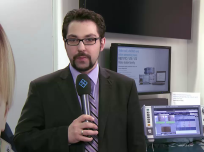 Rohde & Schwarz presented the R&S VTC/VTE/VTS video tester family at the GSMA Mobile World Congress 2015 in Barcelona. In addition to video over LTE testing for different services (eMBMS, video call, video streaming) on mobile devices, the testers now also support speech quality analysis in line with psycho-acoustic methods according to PESQ and POLQA. Rohde & Schwarz presented the R&S®VTC/VTE/VTS video tester family at the GSMA Mobile World Congress 2014 in Barcelona. The video testers are used to test smartphone multimedia applications such as video-over-LTE transmission applications in order to ensure quality of service for end users and to test device interoperability with noncellular technologies such as Miracast, HDMI2.0 and MHL. At the GSMA Mobile World Congress 2012 in Barcelona, Rohde & Schwarz demonstrated the R&S®VTE video tester and R&S®VTS compact video tester, its new test platforms for development, quality assurance and manufacturing applications. Protocol layer measurements and media content check are performed on mobile high definition link (MHL) interfaces. MHL is the new leading audio/video interface on mobile devices. Besides interoperability measurements, application tests such as video over LTE end-to-end performance testing are also addressed.